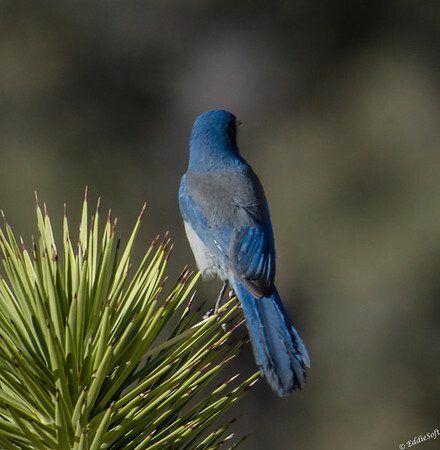 Well, the California Scrub-Jay I was taking pictures of that was perched at the tip-top of a super-high conifer in Riverside, California, did in fact take off and fly a long way to attack me. I barely fended it off with my camera. Then it went into the low branches of a bush right above my head and continued to scream at me. “Mischievous” birds, my foot. 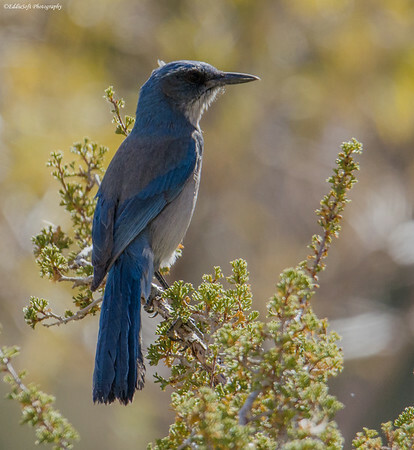 I now have my own Latin name for the California Scrub-Jay. 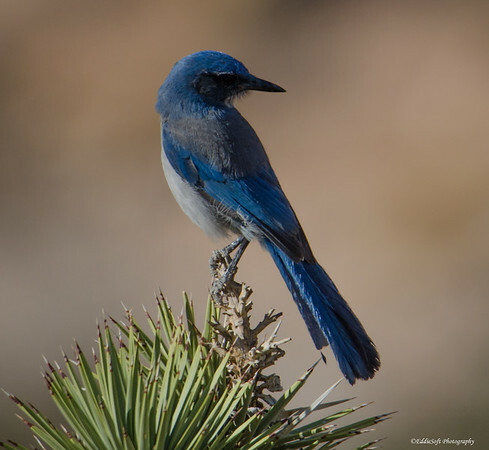 Which is a long way of saying I’m not going out of my way to get a Woodhouse’s Scrub-Jay, thank you. I’ll just enjoy your excellent shots from all angles. Nice job! Seriously, you would willingly bring up in a public forum how you were attacked by harmless cows!?! That is some serious loss of creds buddy – just so everyone knows, Ron is not my brother. Sometime I’ll have to detail the story how you almost died while birding with me trying to help a lady locked in a pit toilet thanks to a bound up metal door. 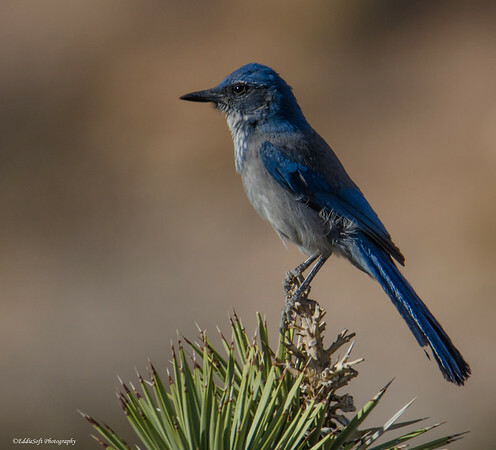 Oh, also liked how you worked in the fact you have a California Srub-Jay … a bird I distinctly pointed out I do not have. Ok- laughed at this! Mostly due to Ron’s comments. I saw you guys got hammered with snow. Been keeping an eye on it as my youngest was heading from St Louis to Chicago for a wedding. Do you think he would let poor mom know where he was and was safe? Hell no! So thanks for the additional snow report on conditions that increased my worry. LOL At least the pretty jay and Ron’s adventures have returned me to a calm state. I heard I-55 didn’t have a bit of snow on it – some weather miracle where everything around it got covered by a foot of snow, but the highway itself was clean as a whistle (do lies make you feel any better ha). Hoping your kid made it safely, it was definitely pretty wicked out there – turns out we are going to get hit again tomorrow and then again on Saturday (the latter coming with 21mph winds eesh). 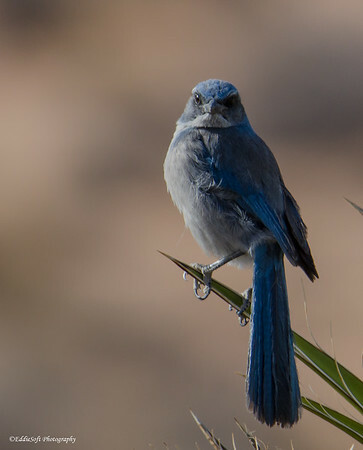 By the way, I think we should all encourage Ron to get posting on his blog – I keep telling him people want to know all the crazy things that happen when we are out birding. Thanks for stopping by… and sorry for the extra worry. Beautiful images B, but I’m afraid I’m distracted by your brothers’s antics, attacked by swallows? seriously? Seriously, it is extremely weird – my hypothesis is in his past life he was a cat and this is all payback. Being attacked by harmless cows was the kicker for me. – you would think he was attacked by a pack of hungry cougars based on his elaborate story on how they chased (…right) after him and he barely got through a fence before they ….what.. squirted milk or spewed their cud at him. I think he put on too much bug repellent and it made him hallucinate. Yes, very surprising! A few years ago I was at McKee Marsh in Wheaton, Illinois, near me, and there was a very big tree just full of Tree Swallows making a real racket. When I walked by I started getting dive-bombed continuously by several of them at a time, and when they would be within about 15-20 feet of me they would start screeching in their high tone. I’m not sure what fraction of the total were involved and my saying I was attacked by the whole tree implies they all attacked at the same time and is in retrospect misleading (sorry), but it was bad. They were flying up very high and then diving at me. They got very close and they would have reached my head except I was waving my camera and zoom lens wildly at them. However, while backing up doing that I fell backwards to the ground on my back, which was embarrassing though no one else was around, and then I fled. I had to pass by that tree again later when I left, but I scooted quickly past without incident. Interestingly, I’ve never had an issue with gulls (had a brief incident with a Black Tern) or Red-Winged Blackbirds, which hover and complain sometimes but have never come at me. The worst of the snow was south of Chicago. I live about 35 miles directly west of “The City” and we only got a few inches. Ron lives in Chicago I mean “The City” , don’t let him fool you. Mind you there were no witnesses for the Swallow attack or the harmless Cow attack so lots of skepticism remains. The best news of all, when we are in the in field, I just walk near him until the critters attack and then back away to continue birding while he is ravaged by whatever happens to spot him from the weeds or trees.